This is one of the llamas at Clove Cottages in New York State. 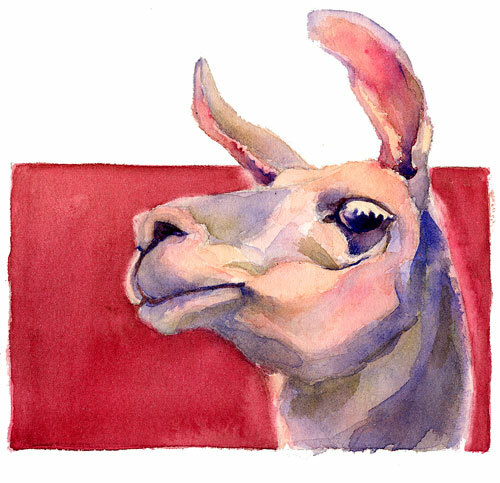 I drew the llama here. She was painted (for a color theory class at the local community college) using a double-split color scheme, which means I used two pairs of complementary colors. Magenta and green, and blue-violet and yellow. Sometimes restrictions upon artwork conversely allow you more freedom. With only four colors available to my paintbrush, I first spent a lot of time playing around, figuring out how those paints would mix. Then I planned the painting—colors and temperatures of the shadows and the highlights. Only then did I start splashing on paint. The actual painting took very little time. After so much preparation, making the picture was exhilarating. It felt like skateboarding down a steep hill; there were some bumpy spots, but mostly it was fast and furious. And I didn’t fall off once.